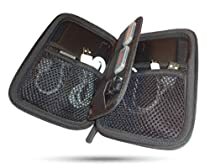 Mogix Electronics Case - Weatherproof - Best For All Mobile Accessories Like Your Battery Charger, Cords & Phone - Can be Used As A Hard Drive Bag too! SO SMALL BUT YET SO BIG - What makes this organizer so great for travel? The fact that you can fit a Mogix power bank, a phone, cords and more all in this small but yet so big case. WEATHER PROOF - Strong exterior but stylish hard case made out of EVA material to protect from damage when dropped or exposed in light showers. INNER MEASUREMENTS - 5.9 x 3.9 x 1.5 inches - Only weighs 4.5oz making this a traveler's dream bag. MULTIPLE COMPARTMENTS - for your electronic accessories, cords, memory cards, flash drives and more! LEARN HOW TO GET THIS CASE FOR FREE - For a limited time, we're sending out 1 free case when 2 Mogix Power Banks are purchased- No Coupons Needed - Just Complete Your Purchase of Any 2 Mogix Power Banks & We'll Send You this case for FREE. Just our way of saying thank you for picking Mogix! The case arrived very quickly. It's made well and seems durable. I wish it was a little bigger to hold a computer cord, all my phone and battery cords plus my watch charger. It will hold a phone charger and a few small, non bulky cords but not much more. This case came free with the Mogix battery I bought. But I LOVE this case! Had I known it was so cool, I would've happily paid for it! The outside is sturdy, so I'm able to shove it in my laptop bag without any fear of crushing it - even when my bag gets kicked around under airplane seats twice per week. Every pocket is really well designed and I'm digging the divider in the middle with the elastic webbing! I received the case and was very impressed with the quality and the look of it. It was also the perfect size from the outside. The only downside is that the adapters don't fit in the case. It is very compact inside and can basically only hold the cords for my chargers. The case is probably great for what it was made for, but not good for me to hold all my chargers.